Sometimes I feel like I’m running out of new things to do with my kids. From the time Sophie started walking, I’ve been all about getting them out of the house to do fun and special things. Now that I have two toddlers, it’s even more important because Jake actually enjoys doing bigger-kid things too! I am always looking for new things to do because there’s only so many times I can handle going to the same bouncy-house place. I also don’t want to spend day in day out at home, because it’s good for all of us to get out every once in a while. Yet at this point I feel like I’ve taken my kids to virtually every kid-friendly, fun-filled place or event in my area. That’s why I was so happy to hear about The Lego Space Hollywood. Kyle and I took the kids and we could not have had more fun as a family! 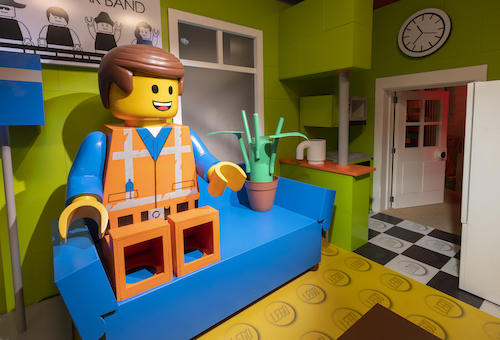 The Lego Space Hollywood is an interactive space filled with life-like characters and props based off the new Lego movie. Sophie and Jake had so much fun interacting with different aspects from the movie at this space. Kyle and I also had a great time, not just because the kids loved it, but because we thought it was really well done. Jake now has a new interest in Legos now after attending this event. Whenever we pass by the Lego section at stores he always points to them. Hm, maybe it’s time to get Jake his first set of Legos? I guess I’ll have to add it to my never ending to-do list and shopping list. Anyways, overall I’m very pleased with the great experience we had and so glad to find a unique thing to do as a family. Once the movie comes out on February 8th we’re going to have to see it because if it’s half as great as The Lego Space, it’ll definitely be worth it. I highly recommended checking out not only The Lego Space Hollywood, but the upcoming movie it’s inspired by too!